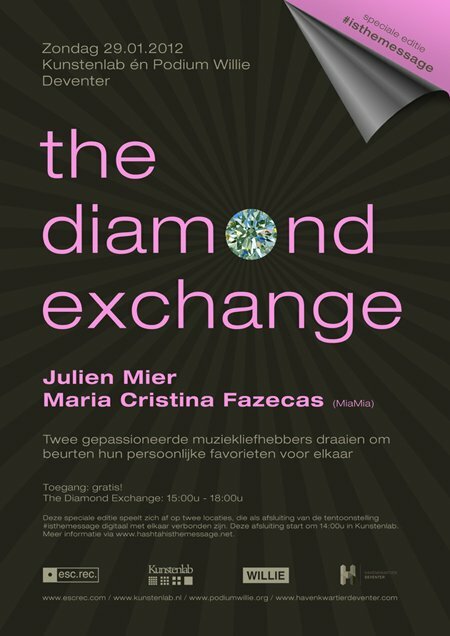 January 29, 2012: The Diamond Exchange #5 | Esc.rec. On January 29, the last day of an exhibition about social media in Kunstenlab, entitled #isthemessage, there will be an additional (and final) program with a presentation of Planeet Faceboek and a special edition of The Diamond Exchange. It starts at 14:00 in Kunstenlab. At 15:00 esc.rec. presents The Diamond Exchange. In this special edition for #isthemessage, The Diamond Exchange not only connects two music lovers this time, but also two locations. One of the participants is at Kunstenlab, the other is at Podium Willie in Havenkwartier Deventer. The exchange of music and communication is via a live stream over the internet. Entrance is free at both locations. Check this pdf for a transcript of the chat between Julien Mier and Maria Cristina Fazecas.